This article describes the steps for Administrators to add users on their Office@Hand account. Go to Users > User list. Click Delete on the right to delete the highlighted user. To delete multiple users, click the box on the right, then click the Delete button . 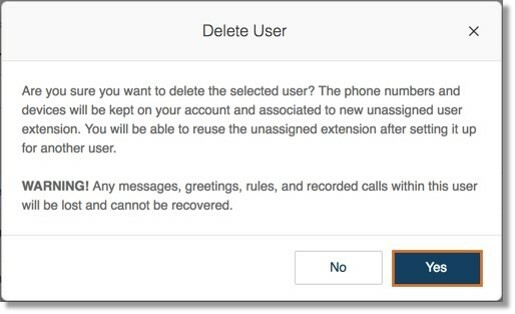 The Delete User warning will appear ­ all messages, greetings, rules, and recorded calls for the user will be lost and cannot be recovered. Click Yes to confirm deletion. A notification window will appear to confirm that the user has been deleted.